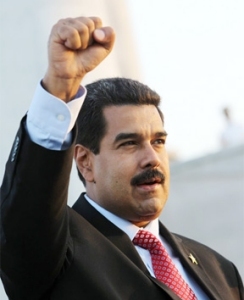 I find it ironic that current Venezuelan President (read dictator) Nicolas Maduro has accused the United States and other countries like Panama of “interfering” in the internal affairs of Venezuela. The fact is that Maduro’s government is being propped up in many ways by four countries that have a vested interest in that left wing government’s survival. Those four countries are Cuba, China, Iran and Russia. It is not hard to figure out why these countries want Maduro’s government to survive—Venezuela exports oil, natural gas and gold to these countries and these exports not only help Cuba stay alive but also power up China’s industries. So these two countries alone want Maduro to stay in power. The Chinese have given the Maduro government specially made light armored vehicles with special light machine guns used in crowd control. These armored vehicles have been used in China to control those who might protest against the Chinese government, and now they are being used in Venezuela. Although it has been denied by the Cuban government, Cuban military personnel have also been reported operating on Venezuelan soil. They seem to be there to guard government facilities such as the oil fields, Venezuela’s military and civilian airports, and also its shipping facilities so the country’s trade can continue. Iran had sent military personnel to help train the country’s militias that are now attacking those Venezuelans demonstrating against the government as well as torturing political prisoners and slaughtering opponents in the streets. And Russia is playing a part by monitoring all communications with its sophisticated spy ships in Venezuelan waters against all opposition to the Venezuelan government. This way the Russians are helping to inform Maduro of what is going on. There is no question that these things are happening, and what is equally scary is that Washington, D.C. is doing little to nothing to stop this. The bigger danger is that this activity by these four countries in Venezuela may not be just confined to Venezuela alone—they may try and gain more control over other countries in South America. Foreign interference in the internal affairs of our neighbors in the Americas is taking on a new meaning.